People ask me all the time where they can find the best bar burger. And when I tell them, “The Trumbull Marriott” I love to look at their reaction. “The Trumbull Marriott?” Yup, the Parallel Post in the Trumbull Marriott is my 2013 choice as the Best Bar Burger from Greenwich to New Haven. The brainchild of Chefs Dean James Max, Chris Molyneaux and Ali Goss this unexpected pleasure was fantastic. Chef Dean is an incredibly gifted Executive Chef, and when I spoke to him, he was in Southern California overseeing the opening of yet another restaurant to add to his portfolio. A resident of Boca Raton Florida and owner of several high end Florida restaurants, Chef Dean worked with Chefs Chris and Ali to create a delicious menu of farm to table cuisine, and the burger was one of those items. The “Double Burger” created by Chefs Dean James Max, Chris Molyneaux and Ali Goss was my perfect Bar Burger. Comprised of seven ounces of grass-fed beef from Ox Hollow Farm, topped with Vermont cheddar cheese, Benton bacon and served on brioche bun from Brothers Bakery in NYC. The flavor of the meat was delicious, deep, rich and then grilled to achieve a nice char on the exterior. The Cheddar was perfectly melted and just sharp enough to complement versus overwhelm the meat. The Benton bacon added great saltiness and smokiness to the burger. The brioche bun was sweet and buttery and grilled for just a little crunch. The fries were also fantastic, crispy on the exterior, soft and moist on the interior and slightly salted. This was a perfect burger from top to bottom. 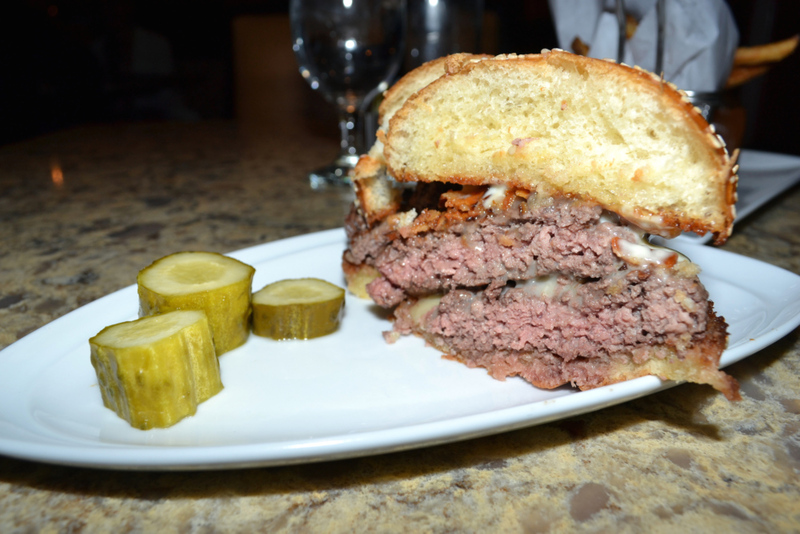 So hat’s off to everyone at Parallel Post in the Trumbull Marriott for creating the Best Bar Burger from Greenwich to New Haven – 2013.